All Levels Hatha: meditation, relaxation, postures! 8-10 POSTPONED Mukti returns! Thai Massage on the Table | $400 | 24 CEUs | See below for details! 29-31 Nischala Devi returns! | See below for details! 18 NEW! 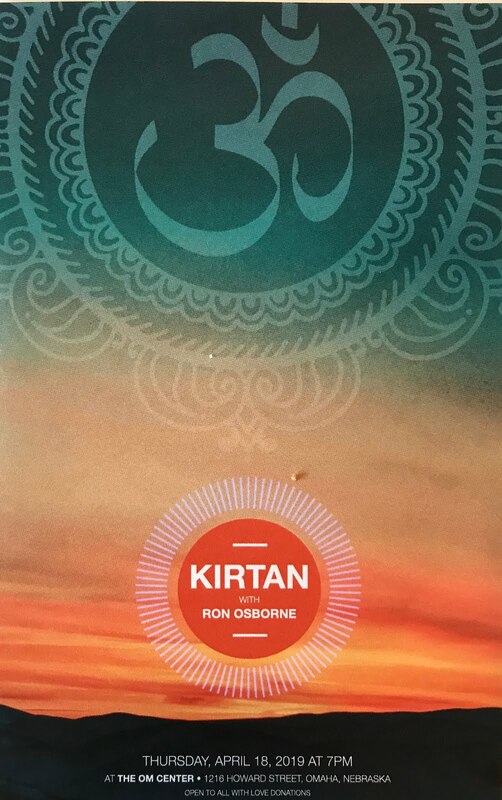 Kirtan with Ron Osborne | 7 pm | love donations | see below for details! 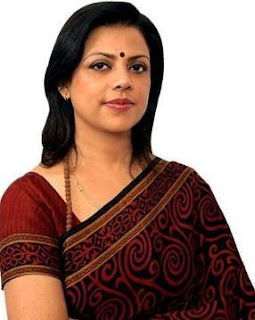 22-30 Dr. Minakshi Joshi, Ayurvedic Physician returns! | See below for details! 4 Learn Muscle Testing with Dr. Tom Smith, D.C. | 1-4 pm | See below for details! 5 Drum and Crystal Bowl Journey with Sue McCarthy and Don McKenna | See below for details! 16-21 Dr. Lama David Bole returns! | See below for details! 18 Introduction to Asian Healing Arts | 9am-5pm | $55 adv, $65 door | See below for details! 19 Tibetan Tranquility Meditation with Dr. Bole | 10am-Noon | $15 adv, $20 door | See below! 31 NEW! 3rd Eye Opening with Brian Assam | 7-9 pm | See below for details! SAVE THE DATES FOR THAI MASSAGE: TWO CLASSES THIS YEAR! Nischala Joy Devi is a masterful teacher and healer. 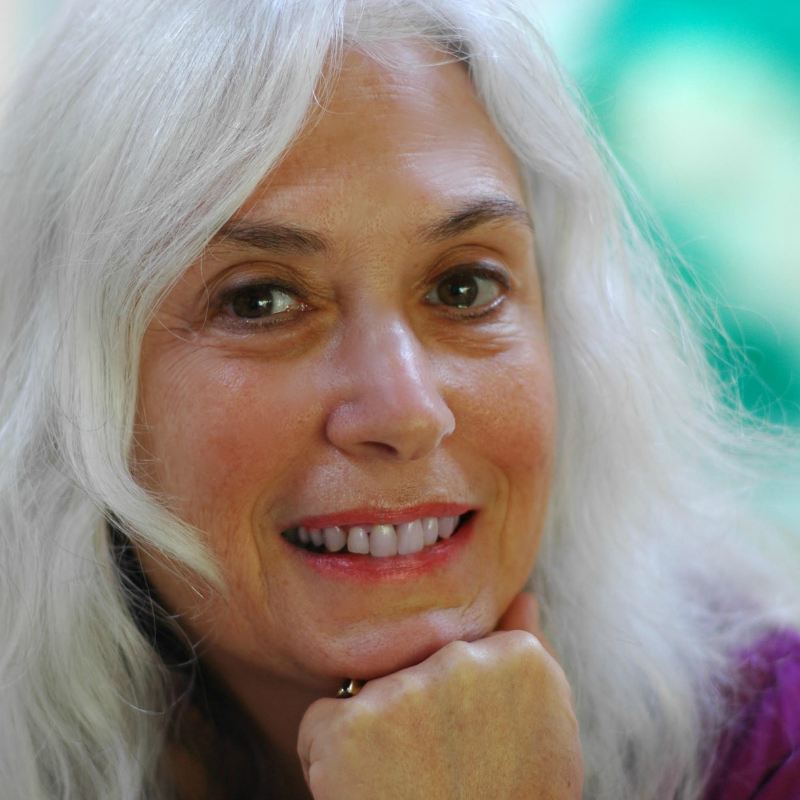 For many years she has been highly respected as an international advocate for her innovative way of expressing Yoga and its subtle uses for spiritual growth. Her dynamic delivery and deep inner conviction empower each individual, allowing the teachings to expand beyond boundaries and limitations of any one tradition enabling her to touch people’s hearts. The monks wanted to stop in Omaha one more time before they return to the Monastery in India! Watch the Monks recreate the ancient tradition of building a sacred sand painting dedicated to Chenrezig, the Buddha of Compassion. Viewing this detailed Mandala opens the mind and awakens the spirit. When a Mandala is built of sand, the goodness it brings is multiplied by the number of grains of sand it contains. Stop by daily to see it evolve. This powerful ritual helps remove obstacles that prevent one from achieving enlightenment. The Lama places colored strings and fabric (ritually fused to represent obstacles) on participants. The obstacles are cut using Weapons of Wisdom, opening the door to liberation, wisdom and achieving your goals. 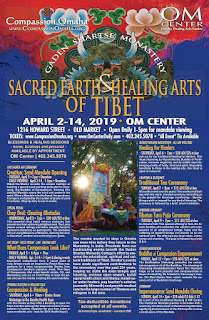 Benefit Art Show - First Friday - Live Tibetan Art! Experience compassion from a visual point of view. Artists create art inspired by Post-it Note suggestions for a more compassionate Omaha from Compassion Omaha’s signature event, Five Days of Compassion. (Art sales benefit artists, CO, and Monastery.) Join us on First Friday to meet the artists and see the monks creating the sand mandala. Join us for our traditional Healing for Healers. This ritual cleansing by Vajravidharan, Buddha of Purification, removes negativity and its subtle imprints, bringing clarity of body, mind and spirit. Especially beneficial to those in the healing arts, this ritual is open to everyone. A favorite event over the years! The monks end their day with this warm, chanted ceremony reminding us to be grateful for blessings overflowing – literally. Bring a wish or request for any kind of blessing. The ceremony is followed by a brief, silent meditation. An Omaha first! This special offering to Tara, the female Buddha who embodies the wisdom and compassion of all enlightened beings, helps end the suffering all sentient beings and assists us on our spiritual path. The offering uses ritual cakes, instruments and chanting. The puja is followed by a brief Q & A. The Bodhisattva Chenrezig embodies the universal compassion of all the Buddhas. The blessing of Chenrezig (Avalokiteshvara/Kwan Yin/Kannon) helps us be more peaceful and compassionate in times of instability. Be initiated to Chenrezig’s mantra: Om Mani Padme Hum, which contains the essence of all of Buddha’s teachings. Be a part of this traditional blessing at OM Center. The meditative Mandala practice culminates with a ceremony and destruction of the Chenrezig Mandala, signifying the transience of life. Participants receive a small piece of the Mandala. Tax-deductible donations accepted at all events. Scholarships available - contact OM. Join Ron Osborne for an evening of kirtan -- call and response mantra chanting! Ron has been practicing and teaching yoga for over 30 years. He is certified by the Sivananda Yoga Vedanta Centers worldwide, completed their intensive 500 hour teachers training course and has visited and lived in Sivananda Ashrams around the world. A Workshop with Dr. Tom Smith, D.C.
Dr. Tom Smith is a chiropractor, and is the founder of Heartland Chiropractic in Bellevue, NE. Applied kinesiology (AK) which is also known as muscle strength testing, is a method of testing various muscles and trigger points which are linked to particular organs and glands. Specific muscle weakness can signal distant internal imbalances. In this workshop, you'll begin learning the art of muscle testing and how it can be used in your practice and daily life. You will learn how to test others, test yourself, and how you can gain information and apply results to your practice and personal health. Learn from someone with almost 30 years of experience in utilizing muscle testing in practice. 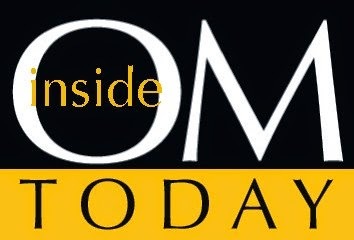 Dr. Tom Smith, D.C. is an 1993 graduate of Palmer College of Chiropractic. He also has a degree from Iowa State University and Faith Baptist Theological Seminary. He is a Certified Chiropractic Sports Physician, is board certified in chiropractic neurology, and is a certified NET practitioner. Drum journeys have been very popular at the OM Center. Based on shamanic tradition, drum journeys support the traveler in a lucid waking dream state that can be relaxing, healing, and informative -- often transformational. 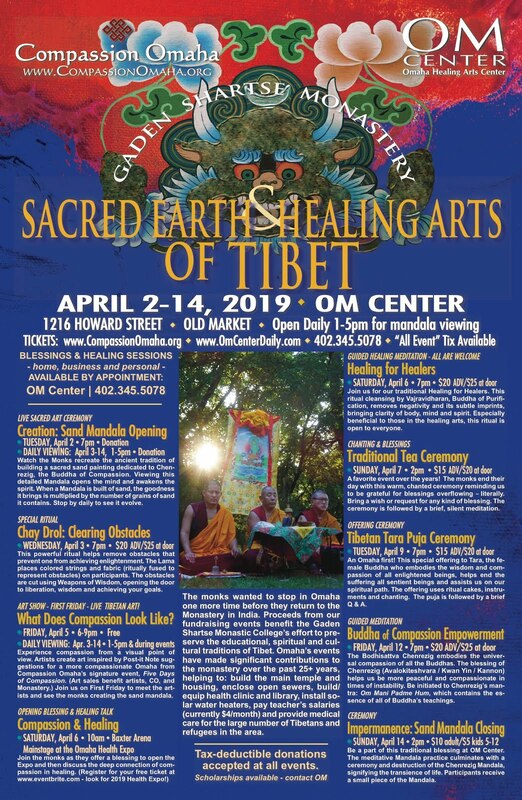 Combined with the penetrating healing power of the crystal bowls, sacred mantras will be chanted for the first time at the body chakras for balance and clarity. All together, this journey is a one-of-a-kind sound immersion experience. Sue McCarthy has been involved with the spiritual community for the past 30 years. She has been facilitating Crystal Bowl Healing and Meditations since her life changed when she was introduced to the bowls. Sue will play her crystal bowls to balance the chakras and heal the body. The waves of sound wash clean and restore our cognitive process to a state of perception and appreciation of beauty that, in and of itself, is a form of gratitude and healing. Having studied in the US, India, and Malaysia, Don McKenna is a meditation and mindfulness facilitator at OM and around the Omaha metro. His drum journeys have been a popular feature at the OM Center over the years. He will be leaving the Omaha area and is offering this token of appreciation to his friends. Toyohari Acupuncture is a refined system of Japanese 5-phase meridian therapy, based on a practitioner's acute palpation, ability to feel Chi, and special non-insertive needle techniques. Appointments available Thursday-Monday, May 16-20. $90 for first appointment, $75 for follow-ups. Call OM to schedule! 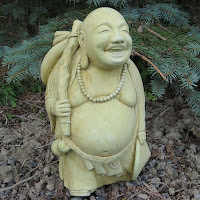 Introduciton to Asian Healing Arts on Saturday, May 18; 9am-noon, 1:30pm-5pm. $55 in advance, $65 day of. CEUs available! Open to all - laypersons and professionals. Learn 5-element approach to a healthy lifestyle; meditation techniques; gentle movement techniques for strength, flexibility, and balance; acupressure massage; and the Psychology of Happiness. MUST RSVP to prepare printed materials. Call OM to register! 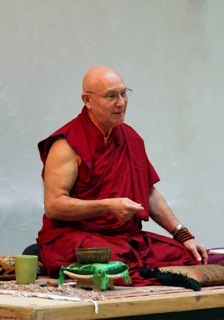 Tibetan Tranquility Meditation Class on Sunday, May 19, 10am-noon. A how-to teaching on Tibetan meditation techniques; how to rest and stabilize the mind, necessary for insight meditation. This is a method for directly seeing the mind's true nature. 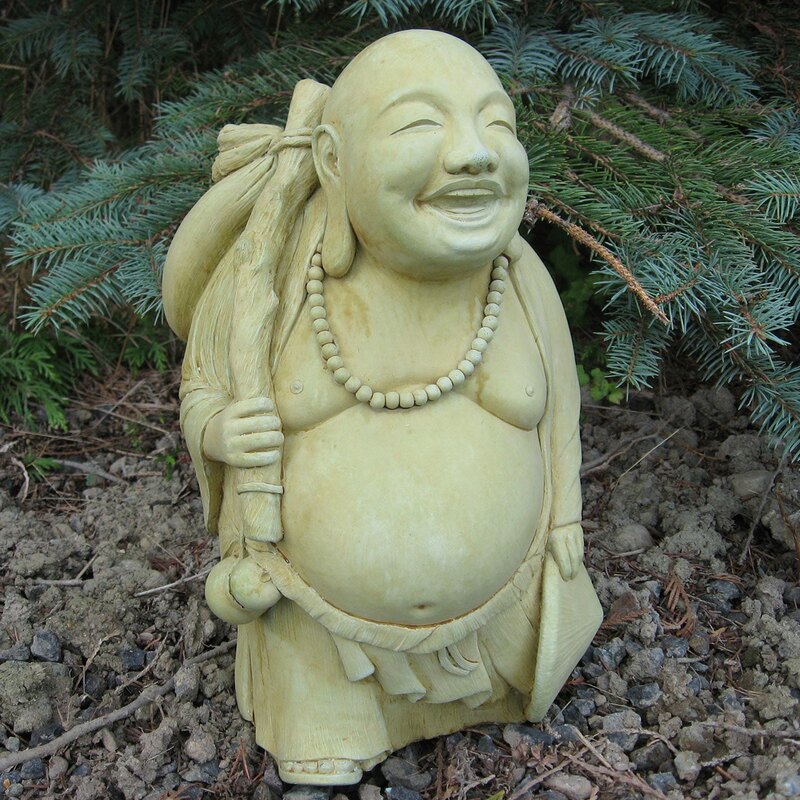 Buddha would often compare himself to a physician and the teachings to medicine. No previous training needed! $15 in advance, $20 day of. Call OM to register! Join us for an extraordinary, deeply healing and profound yoga and meditation experience that will help you realize the infinite nature of who you are and your body’s ability to heal. 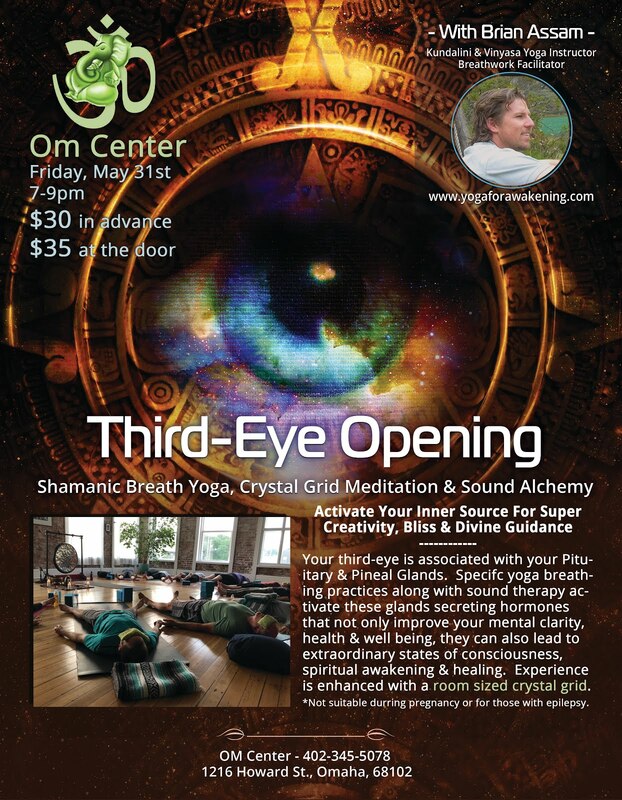 This special event will consist primarily of breathwork, meditation and sound healing designed to activate your chakras and open your 3rd-eye. It will also include a room sized crystal grid which will support awakening this energy. When the third eye awakens it release serotonin, "the feel good hormone,” and DMT, “the Spirit Molecule” responsible for lucidity and expanding consciousness. This process can connect us with higher wisdom and inner truths. It reveals our deepest source for creativity and connection with our higher awareness.